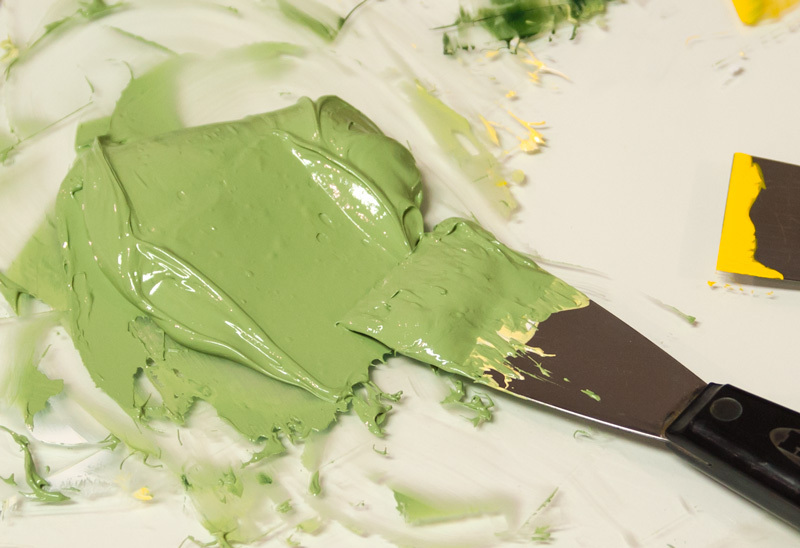 Ink is not paint. Yes, they both have pigment, and in many cases, they both have a linseed oil base (or a modified linseed oil base) but the similarities stop there. Their working characteristics are wildly different. 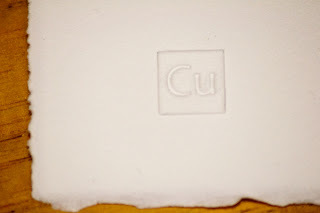 A while back I posted a link to a video about the making of ink (printers ink) that is very similar to the kind of ink that I use. 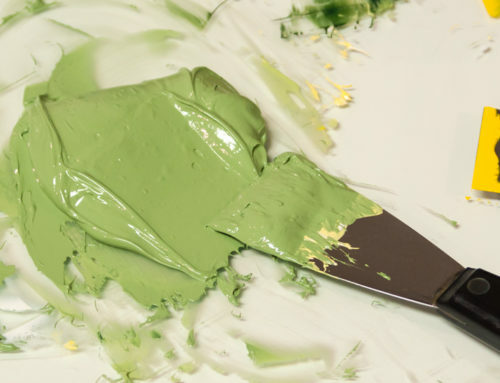 These inks tend to be very stiff (high viscosity) and very sticky (high tack) and are very highly pigmented. 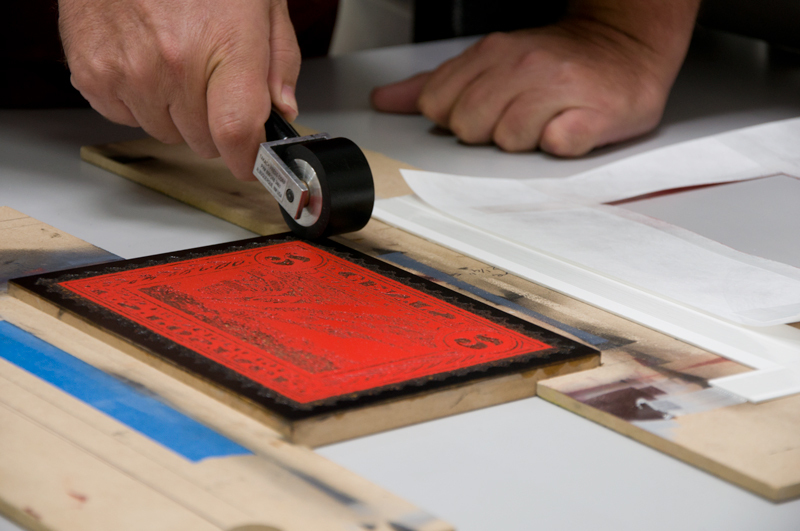 They are applied in very thin layers generally and so the weapon of choice for moving them around is a roller or a brayer. What is the difference? A brayer is a roller with one handle. In general, brayers tend to be small, rollers larger. 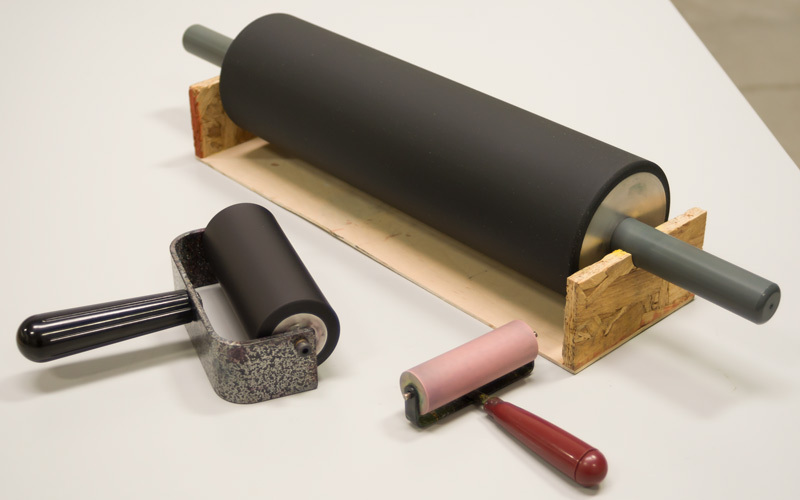 Most rollers/brayers have a rubber surface, although polyurethane is also used sometimes. The hardness of the surface may vary and will have a significant impact on the performance of the roller. 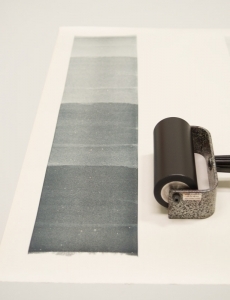 There are two critical dimensions for a brayer. The width and the circumference, which together determine the maximum lap free roll out area. 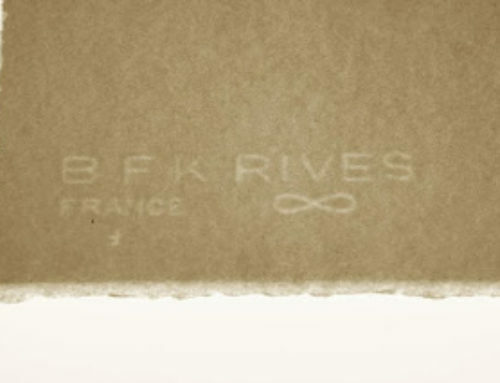 Think of it this way: when the brayer starts to rotate, it begins to lay ink down on the surface. 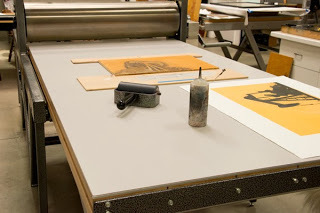 The amount of ink laid down is constant until the brayer has made one complete revolution, creating a rectangle the width of the brayer in done dimension and the circumference of the brayer in the other dimension. 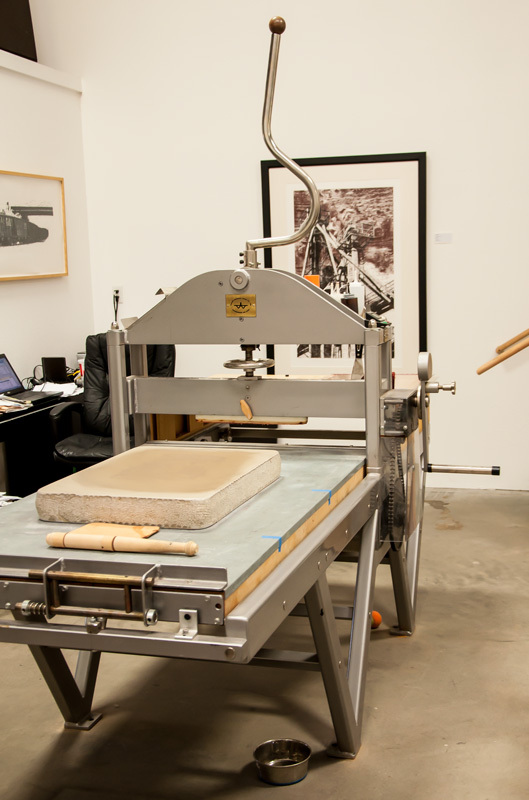 Notice that the brayer in this photo is sitting up on an integral stand. You do not want to leave a roller sitting directly in contact with a surface, as they develop flat spots. 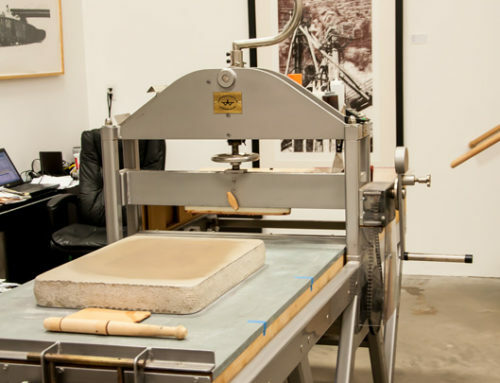 Brayers will usually have a stand of some sort or a method for lying them on their back (the small red handled brayer in the top photo). 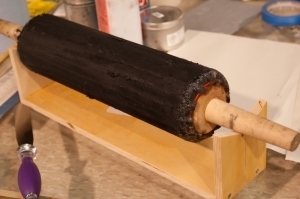 Rollers need to be placed in a chock to keep them elevated. Lithography uses extremely thin films of ink. A leather roller (flesh side out) is the preferred roller for litho work as they are extremely sensitive and will help prevent over inking the image. 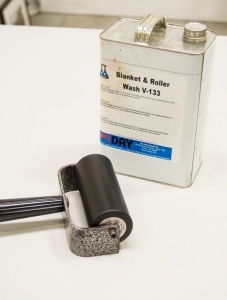 These rollers are never cleaned, just scraped and protected from drying by wrapping and/or covering with tallow. I wrote some time back about an adventure with such a roller. 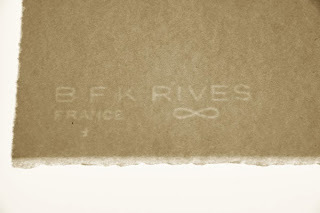 A leather lithographic roller sitting in a chock. A good set of rollers is a significant investment and they should be treated with care. While normal solvents are fine for general cleanup, it is always wise to follow up with a dedicated roller wash. These are formulated to remove residues from other solvents that may harm the rubber of the roller. 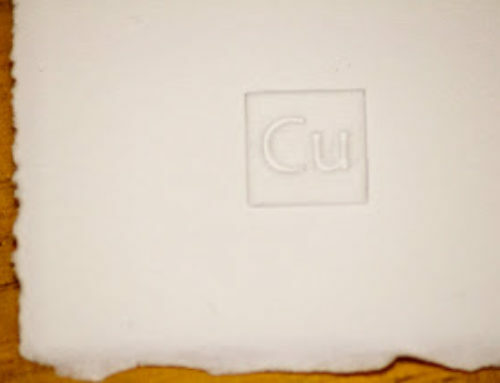 Newer formulations are available that are water miscible.